The historic 1979 Nobel Prize gold medal for chemistry awarded to Professor Georg Wittig (1897-1987) of Germany will be offered by Heritage Auctions on October 19, 2016 as part of Heritage’s two-day Historical Manuscripts Grand Format Auction. Four other gold medals awarded over the years to Prof. Wittig are also being offered together with the large, 22 carat Nobel Prize medal. 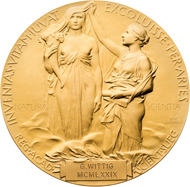 Georg Wittig Nobel Prize Medal. 204 g. 6.5 cm. 22 carat gold. Design: Erik Lindberg. Opening Bid: 95,000 USD. “Dr. Georg Wittig was a distinguished researcher, author and educator who received the 1972 Nobel Prize for Chemistry for his 1954 discovery of what is now known as The Wittig Reaction, a process of regulating the regrouping of atoms in a molecule,” said Cristiano Bierrenbach, Heritage’s Executive Vice President of International Numismatics. “Professor Wittig’s work along with Nobel Prize co-recipient Herbert C. Brown made it possible to mass produce hundreds of important drugs, such as the arthritis medicine hydrocortisone, as well as mass produce industrial chemicals that would otherwise be prohibitively expensive,” Bierrenbach explained. 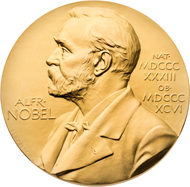 The Nobel Prize medal, designed by Swedish artist Erik Lindberg, measures 6.5 centimeters in diameter (approximately 2.5 inches) and weighs 204.0 grams (approximately 7.2 ounces). Struck in 22 carat gold, it features female allegories of Science and Nature, with Wittig’s name and the year of the award engraved beneath. The front side features the likeness of Alfred Nobel with the dates of his birth, 1833, and death, 1896, in Roman numerals. The medal is housed in the original presentation case received by Prof. Wittig in 1972. The Paul Karrer Award 22 carat, 97.7 grams, two inches in diameter gold medal presented in 1973 by Universitat Zurich. The 14 carat, 123 grams, 2.25 inches gold medal Otto Hahn Prize for Chemistry and Physics awarded in 1967, and is considered the highest German award for outstanding scientific achievements. The Roger Adams Medal given by the American Chemical Society in 1973. It is cast in 10 carat gold, weighs 258.9 grams, and is three inches in diameter. The Adolf Von Baeyer medal awarded in 1953 to Prof. Wittig. It is gold-plated, weighs 83.3 grams and is two inches in diameter. Full descriptions of all the medals are available online. “Most of Dr. Wittig’s scientific work, including that which won him the Nobel Prize, was conducted during his years at the University of Tübingen. He was known as a meticulous teacher who set very high standards for his students, and he established a productive research group of young, promising scientists,” said Bierrenbach. Prof. Wittig died on August 26, 1987, just a few weeks after his 90th birthday. For additional information about the medal or other items offered in this auction browse the online catalog.